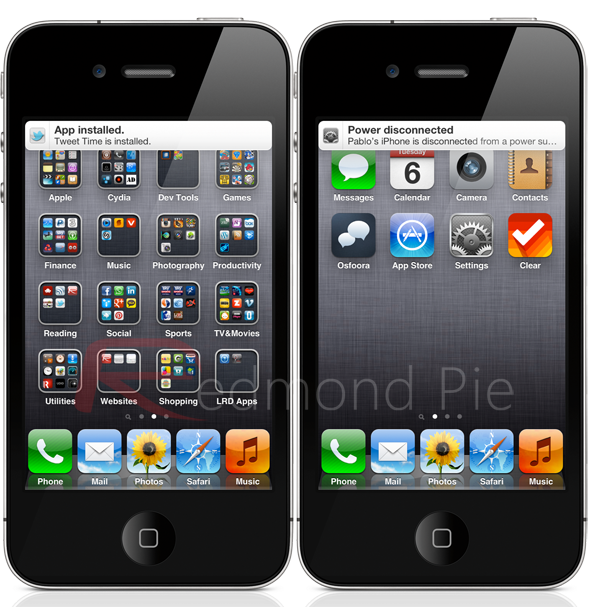 When Apple officially launched the public version of iOS 5 alongside the iPhone 4S in October 2011, the new and improved system wide notification system was generally perceived as a much needed and long overdue addition to the operating system. Previous versions of iOS came with an extremely ugly, and intrusive way of handling notifications by slapping a big blue alert view onto the device’s screen. Not only was this system not in-keeping with the beauty of the OS, but it also provided a terrible user experience, with the alert view making sure that the user was interrupted in whatever they were doing. The inclusion of Notification Center and the iOS 5-style banner alerts definitely represents a large step forward for iOS, and the change has been met with a largely positive response. However, as is always the way with developers who produce work software for jailbroken devices, someone has come along and decided to extend the new notification system to offer user enhancements and allow it to provide notifications for a wide array of system-based events. Notificator customises iOS notifications as you want them to be. It is a tweak that allows you to get notifications about system events on your device. You can replace existing events like the low battery alert by a less intrusive banner or add new notifications to events like joining a WiFi network, installing an application or even switching to a 3G/Edge area. Although I am quite surprised that no one has actually implemented something like this before now, it shouldn’t detract from the fact that Notificator is a very professional piece of work, which to an outsider, will look perfectly native – as if Apple built it that way. The ability to be notified of a wide variety of system events is a very useful one, and something I think a large amount of people would use, although certain events like installing an application are purely there for show, considering that it is a user initiated action. Installation of a new application. When the device is syncing. Notificator is available to download from the BigBoss repository at a cost of $0.99 and requires iOS 5 or higher. Of course, you will need to jailbreak your device to install this tweak. For jailbreaking iPhone 4S and iPad 2, you can simply follow our step by step tutorial posted here to jailbreak iOS 5.0.1 using Absinthe on Windows or Mac. Those of you with an iPhone 4, 3GS, iPad 1, and iPod touches can use Redsn0w or Sn0wbreeze to untether jailbreak on iOS 5.0.1.